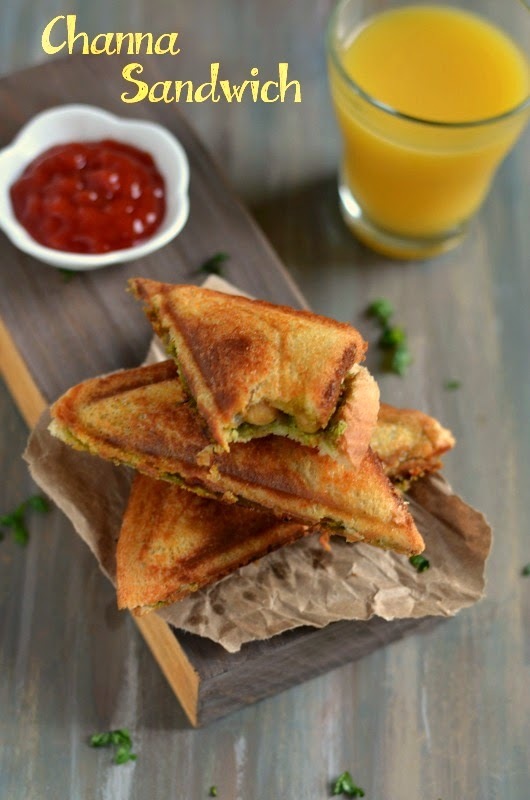 Coming to day 2 of blogging marathon #43,I chose to share a simple and healthy sandwich.As both my kids love to have sandwiches I make quiet often with different stuffing for snack. Soak the channa /chickpeas for 8 hours and pressure cook it for 3-4 whistles in a medium flame. Heat a pan with oil and crackle the cumin seeds,add the chopped onion with a pinch of salt.Add the ginger&garlic paste and fry it for a minute,then goes in the chopped tomato and cook it until mushy. Now add in the spice powders and salt,give it a mix.Add the cooked chickpeas and mix it well till everything blends well.Sprinkle some water if it is too dry.Cook it for couple of minutes or till it becomes dry.Slightly mash the chickpeas with the ladle.Finally add the chopped coriander leaves and mix it well.Now the stuffing is ready. 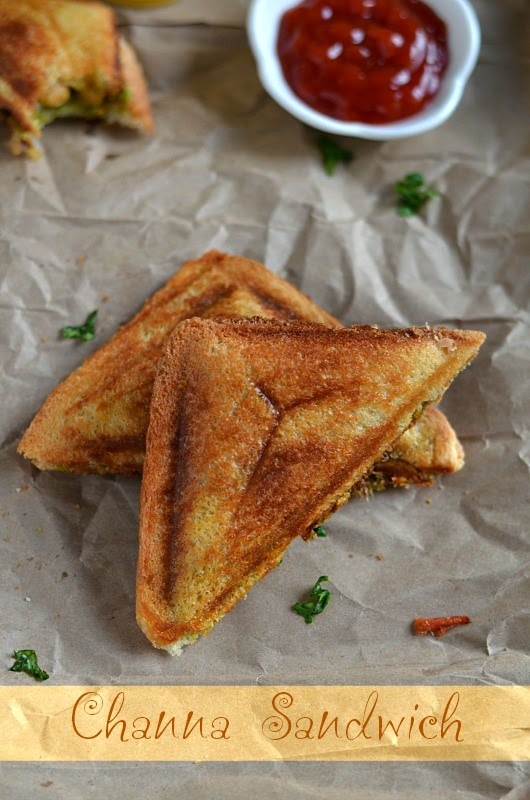 Now apply some green chutney on one of the slice and keep a generous amount of stuffing.Apply butter on the another slice of the bread and cover the stuffing.Apply some butter on the sandwich maker and top of the bread slice,toast it or toast it in a griddle.Cut it into two triangles. Channa Masala Sandwich is ready.Serve it with ketchup and juice. 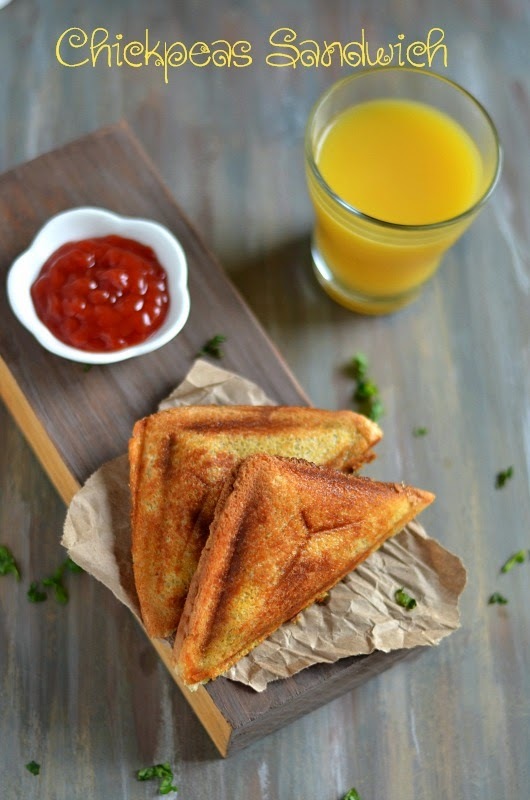 Love your pictures Nalini, makes me want to grab those sandwiches right away! 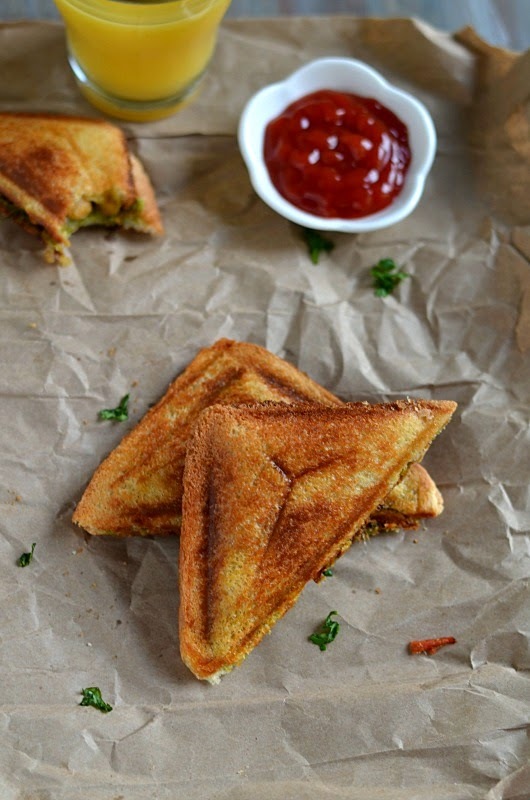 Omg, my mouth is watering here, wat a crispy and addictive sandwich, drooling here. So crispy and delicious stuffed sandwich. Looks too good. Very interested filling. Your sandwiches are browned beautifully. Lovely pictures for a healthy sandwich. That is one nutritious and filling sandwich. Love the idea of using chana as filling.